Information: This false-color mosaic was constructed from a series of 53 images taken through three spectral filters by Galileo's imaging system as the spacecraft flew over the northern regions of the Moon on December 7, 1992. The part of the Moon visible from Earth is on the left side in this view. 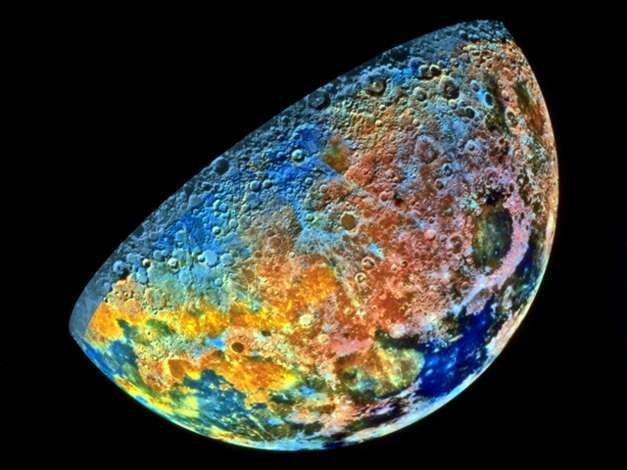 The color mosaic shows compositional variations in parts of the Moon's northern hemisphere. Bright pinkish areas are highlands materials, such as those surrounding the oval lava-filled Crisium impact basin toward the bottom of the picture. Blue to orange shades indicate volcanic lava flows. To the left of Crisium, the dark blue Mare Tranquillitatis is richer in titanium than the green and orange maria above it. This mineral rich soils associated with relatively recent impacts are represented by light blue colors; the youngest craters have prominent blue rays extending from them.